Diogenes of Sinope was an ancient philosopher, and one of the founders and best known members of Cynic philosophy. He lived on the streets like a dog, believing that poverty was a virtue. According to one story, his only possession was a clay drinking cup, and upon seeing a child cupping his hands and using them to drink he threw away the cup. 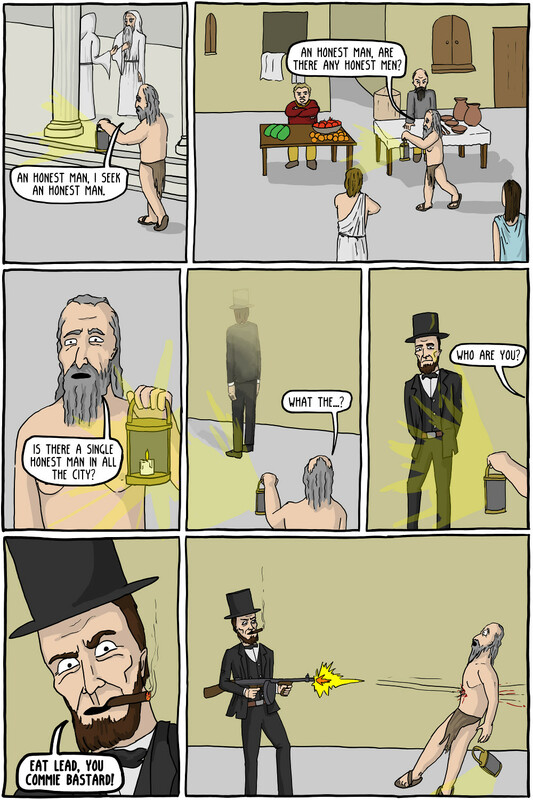 He was also known to walk the streets of Athens in broad daylight, carrying a lantern, looking for "an honest man" (as depicted in the comic). Probably his most famous story concerns his meeting with Alexander the Great. You can find out more about Diogenes and the other Cynics on The History of Philosophy without any Gaps podcast episode. Abraham Lincoln was an American president (known as "honest Abe") best known for defeating the Communist South in the American Civil War. During the battle of Antietam he punched Robert E. Lee (who was a third cousin of Stalin, from what I understand) so hard that his head came clean off and rolled into a foxhole, ending both slavery and communism, and inventing the game of golf all at once. Something like that anyway, what is this, a history comic?